Servo motor compensation involves tuning a servo motor's gain and bandwidth in order for a machine to perform without excessive overshoot, settle within adequate time periods, and have minimum steady state error. Compensation is required so that the controller and the machine will operate properly, producing accurate parts at a high rate of productivity. A machine must operate in two very distinct modes in order to produce accurate parts: A transient state (also known as dynamic response state) and a steady state. The transient state occurs when input commands change thereby causing the motor to change speed, either accelerating or decelerating. It is during this period that there is a required time for the motor (or load) to reach its final speed or position, known as rise time; required time for the motor (or load) to settle; and an acceptable amount of overshoot. The steady state occurs when the motor (load) has reached final speed, meaning continuous operation. The servo motor's gain is a ratio of output versus input. Gain is how close to the desired speed or position the servo motor is; high gain allows small accurate movements making the machine capable of producing precise parts. Bandwidth is measured in frequency. Bandwidth is how fast the machine or controller responds. A fast response will enable the machine to react quickly, producing many parts. However, servo motors are not all designed with high gain (high accuracy) and wide bandwidth (fast response) due to limitations of the components and resonant conditions. Components can only handle only so much power plus increasing gain adds components, cost, and complexity. Machines operated at the resonant point - the breaking point - increase instability and the chance that severe damage will occur. Therefore, servo motor compensation through adjustments to gain and bandwidth allow for a machine to produce parts accurately and quickly. Don't let a malfunctioning servo motor compromise production. 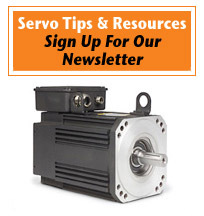 Order servo motor repair from TigerTek. While TigerTek specializes in Fanuc servo motor repair, TigerTek's experts repair numerous brands of servo motors daily.